Do you have questions about arc flash labeling? We can help. Let us know what arc flash information you need, and we'll do our best to assist you. 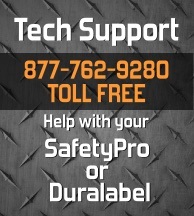 We are your #1 provider for SKM, eTap and EasyPower compatible arc flash labeling. Question: Does your arc flash labeler work with SKM? Answer: Yes. We provide arc flash labeling solutions that work with SKM, eTap, EasyPower, and a number of other industry-standard arc flash calculation programs. In addition, our labeling solutions will print from any Windows software with the included standard print driver. Question: Do we really need arc flash labels? Answer: Proper labeling of arc flash hazards increases safety and decreases liability. Most companies are eager to label all possible risk situations, to avoid accidents, lawsuits, and other problems. Question: Are your arc flash labels made for outdoor use? Answer: Our arc flash labels are UV, chemical and scratch resistant. They are suitable for indoor or outdoor application, in any weather, and will last for years.